2015 is over, can you believe it? What a year it's been!! December held holidays and festivities, new experiences, family and friends, and of course, the beach. Which is all one can hope for for any good month, or year! 1) Our yard is rich with friends. 2) The neighboring block is as well! 3) The Stephen Crane house has some permanent residents. 4) A beach friend takes a meal. December was unseasonably warm (although, since it was last year too, we might have to call it normally warm), so we were able to continue explore our new home. We were able to meet a lot of our furry or feathered neighbors. On one occasion we were able to witness one neighbor eat another. Our new backyard provides endless natural entertainment! 1) A visit to school. 2) A visit to mail. 3) A visit to Deal Lake. 4) A visitor in our backyard. We visited friends and family, some well, some ailing. But we saved lots of time for walking around and enjoying the town. The warm weather meant plenty of beach time. We found some unexpected treasure, such as bird wings and bottle stoppers. 1) Backyard fog. 2) Boardwalk snow. 3) City bus. 4) Front door brush. We got down to work, both with with our day jobs and with quilting and sewing. For me, sewing was a priority. I'd love to keep that up in the new year! We did neat new work, as well. In December, we were able to visit The New School of Monmouth County and helped the students learn ancient games like Mancala and Ahmet. Mad Cat Quilts had our first giveaway which was fun and educational. I can't wait to have another... I was also able to update the shop, something I hope to do more of this year. 1) A giveaway. 2) Front. 3) Back. 4) A winner. Having some time and space now and in the new year is so exciting, we are already taking advantage of it by making home made wreaths, trying out science experiments and working on lesson plans and pattern making. The house is still under construction as far as unpacking but in December we made headway on displaying our many collections. 1) Pink sky at night... 2) Homemade crystals! 3) A mysterious drive. 3) Lost at sea. December went at the perfect pace, new adventures were had, but life outside the city isn't nearly as hectic and grueling. Calm, but productive. January 2016, I hope you're just as calm, but I also have big plans for you. Get ready. We spent the last month of the year gearing up to spend time with family: making gifts, cleaning house, getting things done at home and at work. When our family arrived at the end of the month we were ready and happy to take some time off with them, and show them the city we love. 1) Festive Winter skies. 2) Library scenes. 3) Not your usual nester. 4) Squirrel brunch. In the beginning of the month. I tried to stay home, cleaning and quilting and nesting. I managed to finish some things, but I started some new projects, too. The weather was cold for a bit and it was nice to cuddle up at home. 1) One of our favorite kitties. 2) HST madness. 3) Lovely day Down The Shore. 4) Glass houses in Brooklyn. We did manage to get out some, for walks and to visit some of our favorite place in Brooklyn. At home, we collaborated on some xmas gifts, and projects. By far, the best part of the month was the end when our family came to visit from Tennessee! I got to take them to some of my favorite spots in Brooklyn. It meant so much to me to be able to show them My Little Town. For xmas we went Down The Shore, to show them our other favorite town, and our home away from home. The weather was amazing, so warm people put their feet in the ocean! 1) Lights on the houses, lights in the sky. 2) Cold and festive. 3) Welcoming light in. 4) Nighttime, last of the year. When family departed we headed back to BK and back to work. We spent the last minutes of the year in our traditional way, watching the sky explode over Prospect Park. 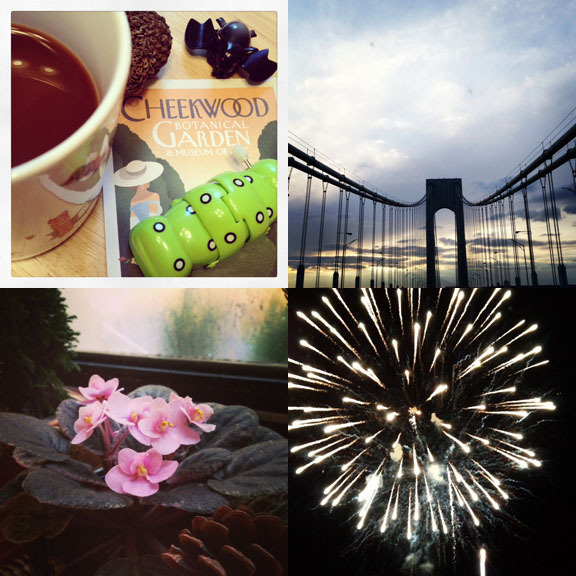 December was a lovely, temperate month, with mild weather, easy days, and wonderful guests. January has begun cold but not too harsh. Over all, 2014 was a great year! Busy and productive filled with new things, learning, and learning experiences. But there was time for rest, contemplation, relaxation, as well. It was a year to reflect on strengths and weakness and what we can improve. But it was also about cherishing what we have and what is good in life. 2014 was a time to get ready for change, to prepare and plan. I hope 2015 sees many of those changes come to life, and is a time for improvements all around. For 2015, I have some goals. January, let's get started! A great month to end a great year. And a great month for photos! Thanksgiving was quite late this year, so the first week in December was all about coming down during the holiday lull. The next week we flew off to Tennessee to see family. Even though it was only the second time I have visited there, it feels like coming home. We had a wonderful time with family! We got to explore Nashville with friends and on our own. The visit was too short. 1) The kitchen table at my In-Laws during our trip to TN. 2) On the way to NJ for the holidays. 3) The windowsill at work never disappoints. 3) Goodbye 2013! A friend of mine sends messages of positivity each morning and in the third week, I embraced his words and set about being positive and happy about a work situation that I'm less than thrilled with. It's helping! Week four was back to being all about the holidays! We went out to see my mom, uncle, brother, and niece and nephew for xmas eve. Despite a rocky start to the day, it was a calm and lovely holiday. After xmas, my dad came in and we walked around Brooklyn and chatted up a storm. We spent New Years Eve in Prospect Park watching the sky explode. The perfect end-of-year celebration. 1) Christmas comes to Green-Wood Cemetery. 2) Our first morning in TN, it snowed and made the holiday even more festive. 3) Even my dad, a classic scrooge, loves xmas. 4) South Slope gets decked. December was a great mix. And a great mix always includes quilts and cats! 1) Been working on this, my biggest and most quilted, quilt for several months. 2) Some holiday goodies were quilted. 3) Flounder lends a hand sorting the stash. 4) A lynx looks on at the Nashville Zoo. Thanks to everyone following Mad Cat Quilts on this blog and on my Instagram during the 12th month! I'm so grateful to be gaining readers and followers. So grateful in fact, that I've decided to do a giveaway when I reach 1000 followers on Instagram!! I'll have more details soon, but in the meantime, tell your friends bc I have a little ways to go! I hope everyone enjoyed December as much as I did, and I hope you all had a lovely start to 2014!